England: Our trip to England… where we had lunch, afternoon tea and dinner (part I)! In July, we had a wonderful shortbreak in England. In the travelposts I tell you all about the places we visited, last week you could read about my first encounter with Airbnb and today you can read the first part of a twofold blogpost of the places where we had lunch, afternoon tea and dinner! 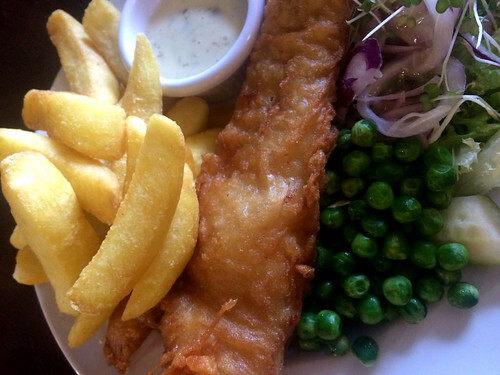 I simply cannot understand people who say that the food in England isn’t good… I guess they should just move their butts out of McDonald’s and go to the nearest pub, restaurant or tearoom… that’ll make them change their minds very soon!! Honestly, we have visited England on many, many occasions over the past 25 years… and I cannot remember one time we didn’t like our food! 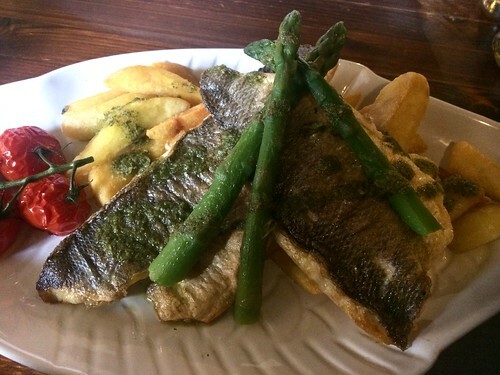 Whether it is in a fine restaurant or in the nearest pub, we can thoroughly enjoy our lunch or diner!! We can certainly take pleasure in a lovely afternoon tea with a fine cup of Earl Grey and a delicious scone. We can savor a nice glass of wine or a good old pint… and England is just the place to find all this! So where did we have lunch, afternoon tea and dinner this time?? 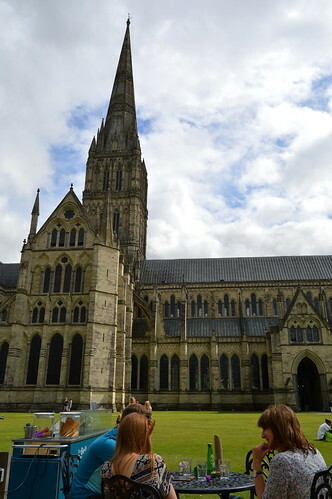 On the first day of our trip, we stopped in Salisbury, which was situated on the way to our holiday home. 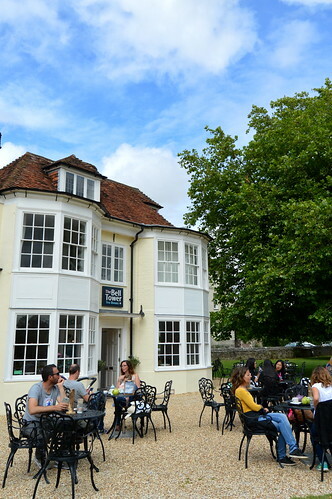 Inside are several rooms to have your tea, but we were lucky enough to score a table on the outdoor terrace enjoying the view of Salisbury Cathedral. We enjoyed a lovely pot of Earl Grey, a fresh scone with clotted cream and jam and had a good time watching the world go by! A perfect way to start our holiday!! On the second day of our trip, we visited Swanage and we also stopped in nearby Corfe, which is a lovely little village of which you can read a travelpost soon. 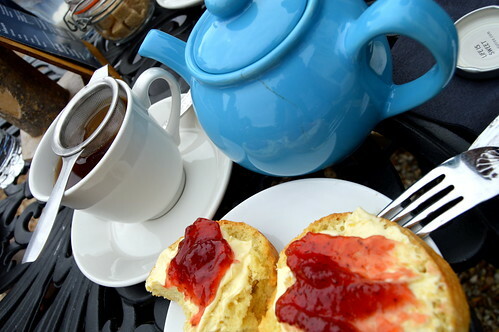 We stopped at the Corfe Castle Tea Rooms for our afternoon ‘tea’… and I put the ‘tea’ between brackets as actually it was just too hot to drink tea so I opted for a sparkling water to accompany my delicious scone! 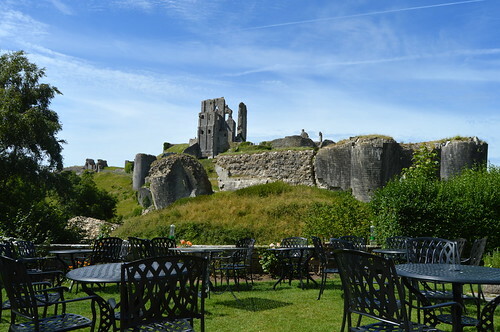 And what a view we had… we sat on the outdoor terrace of the cosy Tea Rooms with a view towards the Corfe Castle ruins. We didn’t visit the castle, but we had a good look at it from where we rested our feet! In the Crown Inn we ended up having dinner twice, as the pub was only a 3 minute drive from our holiday home. The Crown Inn is a 16th century inn, which used to be a coaching inn and up until today, there are still a lot of the original features, like wooden beams, flagstone flooring, an inglenook fireplace,… This public house also features in the iconic novel ‘Tess of d’Urbervill’ by Thomas Hardy who lived in these surroundings. 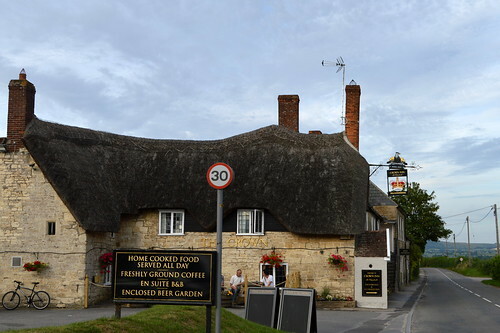 It is a very welcoming place with a lot of rural England charm! 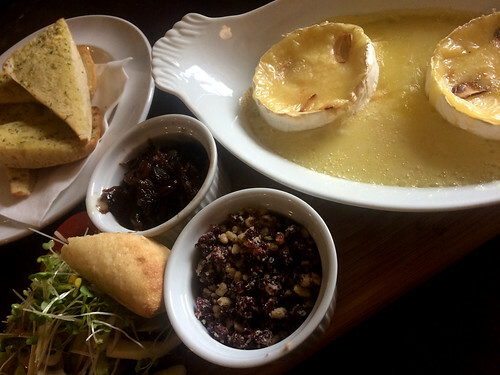 Starter: “Baked Camembert, infused with rosemary & garlic, served with toasted breads & Crown Chutney”. My husband and I shared this wonderful dish, which was quite heavy because of the baked Camembert of course. Perhaps not a summer dish… but oh my God, this was sooooo good! 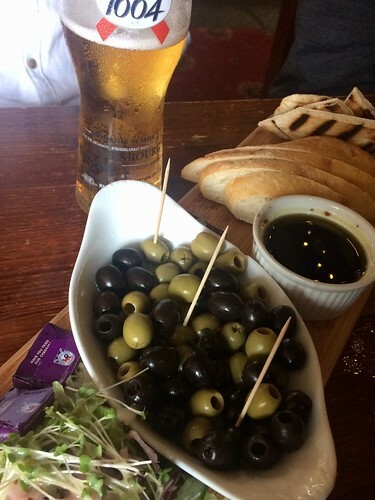 Perfect with a pint of Kronenbourg! A bonus was that you can choose between a ‘normal’ dish and a ‘light bite’. The portions in the UK are quite large, so I opted for the ‘light bite’ which was more than enough for me! We were quite full after these two dishes… but I do like a dessert so I opted for two scoops of icecream. 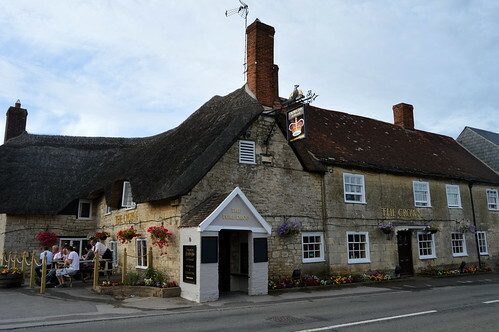 On the last night of our holiday break, we also had dinner at the Crown Inn. Here’s what I ate! I definitely wanted a proper dessert this time and not just a scoop of icecream… so I opted for a lighter starter this time. I shared a platter of bread and olives with the hubby. I like these kinds of platters as it is a very relaxing way to start your diner! This was on the suggestion board and it didn’t disappoint! I like fish and this sea bass was cooked very nicely. The products were of very good quality and were full of taste. The dish actually was served with potatoes, but I opted for the chunky chips. 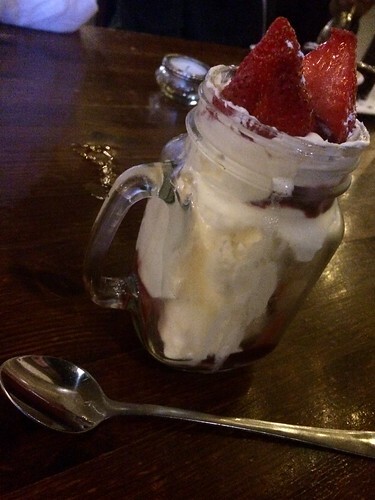 Phew… this dessert… too good to be true!! It came in a chunky glass which actually looked like a jar. Such a lovely way of presentation! And it was goooooood 😛 I had this dessert without the marshmallows though. 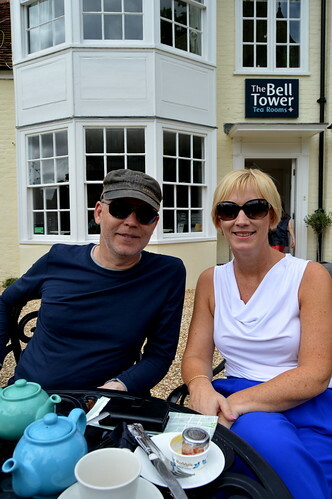 Afternoon tea with a view… Bell Tower Tea Rooms at Salisbury. 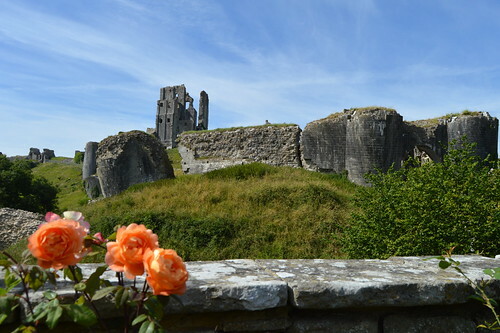 This entry was posted in England, Travel, Travel top tips and tagged afternoon tea, corfe, marnhull, pub, salisbury, tea room, Travel.